The King’s Speech deserves the superlatives that have been showered on the movie since its cinema release. It has just arrived in the UK and I watched it last night in a West End theatre where it was treated to loud applause at its close. I cannot remember the last time I witnessed such a warm reception for a movie. Colin Firth, who plays our present Queen’s father Prince Albert – who became King George VI when his elder brother David abdicated to marry Mrs Simpson – must be a strong contender for best actor come the Oscars. 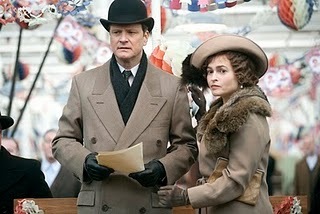 As you probably know the film focuses on Bertie’s attempts – supported by devoted wife Elizabeth (ably played by Helena Bonham Carter) – to conquer his debilitating stammer. Into their lives comes unconventional Aussie speech therapist Lionel Logue (Geoffrey Rush must also be in line for film honours) to wrestle with the underlying causes of Bertie’s impediment. The film exposes the roots of the dysfunction that has surfaced in Britain’s Royal Family in successive generations – the loading of massive expectation on children who are blessed with no greater ability than those of any other upper class family. It is to be hoped that Princess Diana lived long enough to give the necessary love to her sons William and Harry that many of their older relatives seem to have been starved. The film’s director and screenwriter, Tom Hooper and David Seidler respectively, have managed the seemingly impossible. You suffer with a King – the personal drama is never submerged by either pageantry or the sweep of history. It will be interesting to see Madonna’s take on the Duchess of Windsor. The Material Girl is currently directing a biopic about Wallis and is bound to be more sympathetic.